Vincent van Gogh did a good job painting the exploding Tardis from Doctor Who and now you can have some fun with it to. 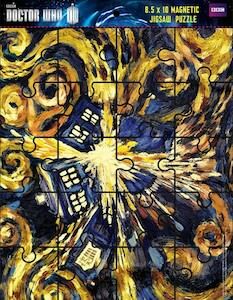 This is a 8.5 x 10 inch puzzle of the exploding Tardis but not just any jigsaw puzzle this one is magnetic and that means you can have it hang on your fridge. Now you and your friends can try to assemble the Doctor Who painting while cooking a meal. 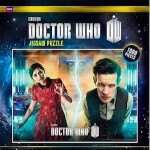 Puzzles are fun and that is why the Doctor is in so many adventures as it is all a bit puzzle.